Yes, you read that correctly. Please pause for a moment to allow this information to sink in. This guy was just a football coach, right? Did he rescue children from flaming buildings on the side? Did he donate his entire salary to the Red Cross? Was he a covert freedom fighter in Latin America? Was he Pope at one point? I'm being serious here. 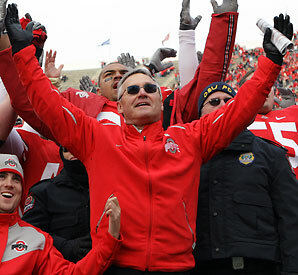 What the hell did Jim Tressel do to warrant his god-like status in the state of Ohio? Really? What?! He beat Michigan? Okay, I get that. But I would warn OSU fans that the "He beat Michigan" argument is quickly going to mean less and less as time goes on. OSU took away last year's win...and I would expect the NCAA to take away a few more before this is all said and done. I'd say if the Ohio HS football coaches really wanted to honor Tressel, they should play their first week's game, and then pretend it never happened. That would be a more fitting tribute. The antics at OSU and the reaction from Buckeye fans has kept this off-season very interesting. I say keep it up! The Michigan blogs thank you.